A haunting, but masterful film, told with the natural beauty of a Terrence Malick movie, but the harsh and detailed reality that could only be by Danny Boyle. Danny Boyle is the most authentic filmmaker out there. I am not talking about documentary-style realism or anything like that, but I am talking about the way he is constantly turning out gutsy, creative, and consistently good movies. I first took notice of him back in 1996 when he made Trainspotting, which is what I consider the greatest drug movie ever made. It was stylish and artistic, but unafraid to show the terrors of the life (a dead baby, an innocent friend who gets aids), while mixing it together with comedy. It was one of those movies that nobody would have ever thought could work. Yet, it not only worked, but also was fantastic. Boyle went on to make other movies that turned into mainstream hits such as 28 days later (which unfortunately lost a lot of it’s acclaim after the lousy sequel came out, similar to how the crappy matrix sequels took away from how great the original movie was), and Boyle made Slumdog Millionaire. That movie won the Oscar for best picture of the year of course, but it was hardly a traditional win (like say, the king’s speech). Instead, it was an Indian movie, set in India, with all the characters being Indian, and immersed in Indian life and culture. Somehow, Boyle, who is not Indian at all, but British, made the ideas work for not only India, but for the entire world. Clearly, this guy embarks on endeavors that most filmmakers would turn their backs on. Even guys who are supposed to be our most artistic and creative American directors, like David flincher, end up making movies (like the social network), which still maintain his style, but are clearly made for the main stream. Boyle would never do such a thing. 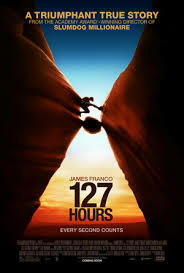 Therefore, his latest movie, 127 hours, often feels more like a documentary than most movies do as the main character spends nearly the entire movie by him. Yes, there are elements of cast away or I am legend in here. Only somehow, this movie does not feel like it. This is not a story about the last man on earth or even a man trapped on an island or world all by him. Instead, he is just trapped in a hole. And Boyle helps us remember that there is a much larger world out there, which Aron (James Franco), is a part of, by constantly giving us flashbacks, and using them as thought bubbles for what apron is thinking about. The story is extremely basic. A rebel hiker is biking through a canyon in Utah and becomes trapped under a boulder. For the first twenty minutes of the movie, we are with Aron as he bikes around at rapid speeds and then scales giant rock walls. He meets two beautiful girls who are out there hiking together and offers to show them around a little. They agree, and the three of them go off together, with Aron leading the way. He takes them to a cliff where they have to wedge themselves between rocks and then let go, dropping through a massive canyon into a pool of crystal clear blue water. It is a magnificent sight, not just the water, but also the drop that leads the characters there, and Danny Boyle gets the most amazing shots of the characters falling through the canyon. However, the good times must come to an end, and before long, we are with Aron alone again. He is certainly reckless, as we could tell from early on when he was riding his bike as if a dirt racer in a competition, basically crashing through the dessert. At one point he even took a hard fall, slamming into the ground, but then just got back up, laughed it off, and continued on his way. The movie gets to the big boulder trapping moment much earlier than expected. We are barely a quarter of the way in and already he finds himself trapped. We do not expect it to happen so soon because we figure once that happens; the movie does not really have anywhere to go. Aron is literally trapped under the boulder for nearly the rest of the movie. However, Danny Boyle knows his movie is not about the character’s life before the boulder. It is about his character’s experience with the boulder. Therefore, Aron comes to this drastic event early on in the movie and remains there for nearly the entire rest of the film. So, what happens in between? If the movie puts him under the boulder from an early point in the running time, than the big question has to be how does this movie maintain our attention? It does that by showing the many different survival techniques and ideas that Aron comes up with. Yes, we all know he will eventually cut off his arm, but that happens to be the very last of his many, many attempts at getting out of there. It would be no fun to watch a movie about a person who was not smart being trapped in a spot like this. A person like that would probably end up dying. However, to watch someone with all kinds of creative ideas for things that just might possibly work, can be very interesting. Such was the case with cast away, and such is certainly the case here. Aron tries lifting the rock, cutting the rock, and even making a sort of pulley. None of it works of course. Once he realizes that he will be down there for a while, he takes off his back pack, removes the contents, puts them all in front of him on the rock, and just stares at them, trying to think about which of these items he might be able to use. The movie keeps our attention not only by throwing some very clever escape attempts our way every now and again, but also by having Aron talk to himself and even hallucinate. We stay with Aron’s thoughts, and so sometimes he is just imagining what is going on out there, sometimes he is having flashbacks to past memories, and sometimes he is really hallucinating or dreaming. All of it is interesting. The movie looks incredible with its fantastic scenery and exciting approach to shooting it with mostly quick shots. Split screen is employed here every now and again, and when it is, it is mostly split up into three different sections. I am not crazy about that, but otherwise the artistic moves all seem to work out. The movie definitely builds in intensity as it goes on, leading up to Aron’s crazy escape. In addition, I love the way his moment of getting out is shown in such detail, as are the specifics of how he would have to do that. For example, there is a shot that goes inside his arm to show the way the knife digs through the flesh, but cannot get past the bone. I have not seen a shot as detailed as this since a bullet entered mark Walberg’s chest in three kings. 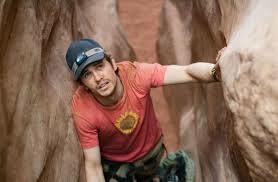 However, 127 Hours is something special. It is not the kind of movie you can watch repeatedly, but it is certainly well made, enjoyable, and quite the fascinating experience.